I really have difficulty understanding Democrats, especially Democrats like Mike Feuer, member of the California State Assembly from the 42nd Assembly District (West Hollywood, Hollywood, Beverly Hills, West LA, Studio City). 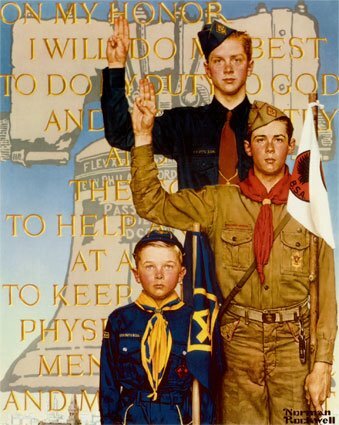 Everyone understands the good that the Boy Scouts do, and have been doing for 100 years. I was a boy scout. It was a valuable experience for me in my formative years. It taught me many things. One thing I learned was how to be responsible for myself. Another was that you had to be honorable as well as moral. Effectively, how to be an adult. It was a healthy and positive experience for me, as it was for tens of thousands of boys who went through the scouting movement for the past 100 years. Does Mike Feuer not understand that one of the elements of scouting is that young boys go on overnight camping trips with their troop leaders and scoutmasters. Some parents of young boys would be reluctant to send their son on an overnight camping trip if they knew the troop leader or scoutmaster was gay. Yes, I know that few gay men are pedophiles, but some are. Yes, I know that some heterosexual males are also pedophiles. However, it is a matter of perception. Parents will feel concerned that their child might be a victim of sexual abuse. So, Michael Feuer got the other Democrats on the committee to kill the resolution honoring this fine service organization. The resolution lost on straight party line vote. All Democrats voted to kill the resolution. All Republicans supported it. The Democrats on the committee who voted against the resolution are Mike Feuer, Julia Brownley, Noreen Evans, Dave Jones,Ted Lieu, William Monning and Pedro Nava. Republicans on the committee supporting the resolution were Van Tran, Curt Hagman and Steve Knight. Gary post vietnam democrats are actually easy to figure out, take anything you know to be good about our country, and we as a people and forget it. They are to busy making social and political statements to waste time honoring those who really do step up to do meaningful social good.